Your enquiry has been sent to Gabriel Ancu and they will be in touch directly within the next few days. Professionally trained person who can train and motivate you achieving your goals in the most simple and effective way possible. I am very passioante about what I'm doing and with my energy, experience and skills I am able to motivate, support and get everyone to commit becoming fit and happy with their new life style.To show you how I work, I would like to offer you a free physical, nutritional and life style consultation. This allows us to discuss your objectives and challenges so that I can design a program to specifically address what you want to achieve. Training sessions are intense and various to keep it challenging and fun. From fat/weight loss to strength and conditioning, everything will be tailored on my client's goal. The training sessions can take place in a gym, park or at my client's home/place, all the equipment will be provided. As a bonus, you will be getting constant support and encouragement and in addition to a better body, you'll also see the benefits to your mood and state of mind. As a sport background I can say that I was a professional footballer for 13 years. I am a bachelor in Physical Education and Sport as well as qualified level 3 personal trainer, boot camp coach and spinning and aqua aerobics instructor. I have been working as a bootcamp coach and personal trainer for more than 7 years. More info and special offers on my website. Rupert T - London Bridge - I started training with Gabriel 4 months ago in a bid to lose stubborn upper body fat and improve my overall fitness. Gabriel developed a balance plan mixing both strenght and cardio to keep my training varied and fun. The combination of TRX exercises, free weights, circuit training and boxing in a outdoor space has really worked for me, espescially as I've never liked the gym environment. Gabriel has a great way of getting more out of me and has even motivated me to keep a healthier diet as part of my fitness drive. I'm feeling stronger and more energetic than before and I'm looking more toned than I ever have. 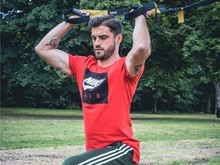 Rob W - Lewisham - I noticed a faster increae in fitness and muscle tone compared to other exercise programs I have done and unlike previous trainers, Gab is 100% focussed on helping you achieving maximum results from your session. He always knows where you are in your goal attainment and how far to push you next time. I recommned him highly. Maria S - Blackheath - Working with Gabriel was one of the best invesment I made. He is a good combination of tough and careful, he took time to get to know my personality and lifestyle, in order to provide the appropriate exercises and advice related to nutrition and health. I could see the changes after a few weeks. He is very focussed on providing the keys to a healthy lifestyle which is what everyone needs on the long run. Eason W - Greenwich - I started to train with Gabriel about 6 months ago. I am thoroughly satisfied with my progress up to date. He tailored a training programe for me and keep adjusting according to my conditions and progress. I feel motivated all the time and most importantly he is always there to ensure that I am doing moves correctly and safely. Beyond some very noticeable physical results such as removing belly fat and gaining muscles, I feel much more relaxed and healthy both in my personal and professional lives. To be honest, I am quite addicted to do gym now. Training with Gabriel is not just about getting bigger, but also better. Sabrina Lee - Canary Wharf - Highly recommended! I used to think fitness training is not for girls or at least not for me. However, training with Gabriel for only 2 months up till now has completely changed my mind already. It turns out to be very interesting and interactive. We train not only in the gym, but also in the park for different exercises. I also benefit a lot from Gabriel's nutrition advice. He mapped out a nutritional plan for me and now I feel slimmer and healthier.